Recently, a group of Central American migrants, organized by the nonprofit Pueblo Sin Fronteras, garnered attention for traveling through Mexico toward the U.S. border in order to petition for asylum.1 Many of these individuals were fleeing for their lives, escaping threats including brutal gang violence, domestic abuse, extortion, rampant political unrest, sexual abuse, and transgender discrimination.2 The caravan, though widely covered in the media, is not the only means by which asylum-seekers attempt to reach the United States; others travel alone or in smaller groups. In recent years, many individuals from the Northern Triangle countries of Central America—Guatemala, Honduras, and El Salvador—have left their homes to seek asylum in the United States.3 International law enshrines the right of such individuals to seek refuge in other countries,4 and U.S. law confirms that those escaping persecution are eligible to apply for asylum protections.5 Without going through Congress to change laws, the Trump administration is taking steps on its own to drastically reshape the asylum process. The administration is not only making it harder for individuals to apply for and receive asylum, but it is also calling into question whether applicants can access the protections from violence, torture, and threat—to which international and domestic law entitles them. In short, the asylum process is becoming another casualty in the Trump administration’s relentless attack on the rights of immigrants and refugees. This issue brief presents some major challenges that asylum-seekers may confront as they navigate the U.S. immigration system under Trump. It focuses first on the administration’s stricter eligibility standards, before exploring asylum-seekers’ increased detention periods and decreased opportunity to make their case in immigration courts. Finally, the brief looks at how these policies are tearing immigrant families apart and considers what’s next for asylum seekers in the Trump era. In January 2017, President Trump signed executive order 13767, which instructed the secretary of homeland security to revise this process.8 In response, the Asylum Division of USCIS released new lesson plans for use in training asylum officers to recognize legitimate fear.9 Among other things, the new lesson plans create a higher standard for establishing fear in interviews.10 These changes could bar applicants with legitimate claims from accessing a full hearing in immigration court. Applicants who are dealing with language barriers, complex situations, and traumatized applicants would be especially vulnerable to losing their right to a full hearing.11 Without a hearing to establish the facts of a case, even a small error on a form could sabotage a valid asylum claim. A Department of Homeland Security (DHS) memo explaining the changes states that the goal is to prevent abuse of the system.12 This follows from the administration’s belief that individuals who pass a credible fear screening but ultimately fail to receive asylum must have been gaming the system in the first place. But this represents a serious distortion of the purpose of the credible fear process—it was designed not to identify perfect asylum claims but rather to weed out frivolous claims in order to ensure that the United States does not violate its legal obligations by returning bona fide asylum seekers to face persecution abroad—and it ignores the structural obstacles that prevent even legitimate asylum seekers from succeeding in their claims, such as overdetention and underrepresentation. Perhaps unsurprisingly, Human Rights First reports that following the change in lesson plans, the percentage of cases in which asylum officers found applicants to have a credible fear for their safety dropped from 78 percent in February 2017 to 68 percent in June 2017.13 Despite this overall trend, however, 205 of the 216 caravan members mentioned above who received credible fear interviews as of June 3, 2018, were found to possess credible fear.14 This finding likely emphasizes the severity of the dangers they face in their home countries. Overall, the Trump administration’s efforts to raise the credible fear standard are expected to result in legitimate claims being denied in the early stages of the asylum process, even before asylum-seekers have the chance to make a full case for their lives. Moreover, in April 2018, the Department of Justice (DOJ) ratcheted up pressure on the asylum process by requiring immigration judges to decide at least 700 cases a year, or roughly three cases per day.18 Judges facing these new, ambitious annual case completion quotas could feel pressured into making decisions without giving applicants sufficient time to obtain counsel or secure necessary evidence. When it comes to adjudicating asylum applications, increasing the risk of judicial errors means increasing the risk of deporting people to countries where they face harm or even death. The recent steps taken by Sessions and the DOJ combine to reshape the immigration court process for asylum seekers so that it favors speedy decisions over meaningful due process under the law. Freedom from detention is often critical to success in the asylum process, allowing applicants to gather evidence and documentation, secure translations of key documents, and earn money to pay for counsel in court proceedings. Nine out of ten asylum applicants without the benefit of counsel lose their cases,29 compared with roughly half of those who have legal advice.30 Again, the consequences are steep: Losing a case could mean that an asylum seeker is deported to face harm or even death in their home country. The Trump administration’s criminalization of immigration and immigrants is circular; it paints asylum-seekers and other immigrants as criminals in order to justify changes to policy and law that further prevent them from accessing legal status. 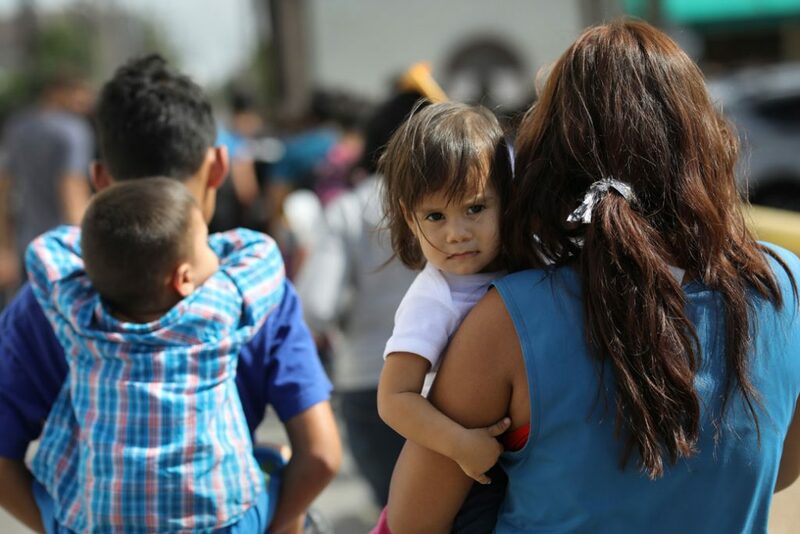 All these new policies and practices make it even more difficult for legitimate asylum-seekers to make their claims, while subjecting them to the horrors of family separation and prolonged detention in subpar conditions. What’s next for asylum applicants in the Trump era? This administration’s actions will continue to affect asylum-seekers in the United States for years to come. Demonstrating respect for international and national norms would do much to usher in a more humanitarian approach to asylum—one that includes alternatives to detention and a nuanced and culturally sensitive understanding of fear. Such an approach would also help preserve immigrant families—and give persecuted and vulnerable populations their deserved day in court. Anneliese Hermann is an intern with the Immigration Policy team at the Center for American Progress. The author would like to thank Tom Jawetz, Philip E. Wolgin, and Silva Mathema from the Center for American Progress for reviewing this brief and providing invaluable edits and suggestions.